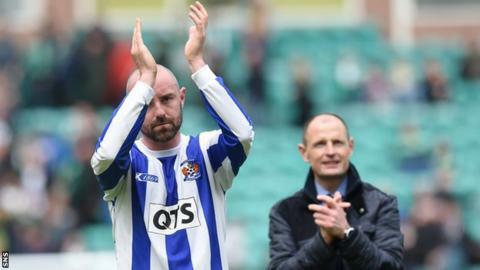 Kilmarnock say they have "a great chance" of holding on to top scorer Kris Boyd after he made sure of their Scottish Premiership safety. The Ayrshire side only needed a draw from their final match of the season against Hibernian but Boyd's first-half strike secured victory. Hibs will now need to win a relegation play-off to stay in the division. "We definitely want him in our team for next season," said incoming Killie chairman Billy Bowie. "We've got a new future ahead of us, we're debt free, we've got a good team. "I believe in continuity, we're starting off with the same manager. So, we've got all the right ingredients to start the next season very positively." Manager Allan Johnston described the winning goal as "typical Kris Boyd" and echoed Bowie's keenness to keep the striker, who is out of contract this summer. "He's a top quality striker," said the manager. "You just can't give him a chance because he'll finish it off. He's a massive player. His experience is invaluable. You're looking to try and keep someone of that quality, even though we know it's going to be very difficult. "I thought we deserved it [the win], we were the better team. We passed the ball better. "But it was a nervy game and I'm just delighted with the boys' attitude. It was fantastic. They were throwing themselves in front of shots, crosses; you could see what it meant to them." Both Johnston and his namesake Michael, who is stepping down as chairman, praised the travelling fans at Easter Road. And the former Queen of the South boss admitted uncertainty in recent weeks had caused problems. "It's been difficult because it's hard to plan when you don't know where you're going to be, how much money you're going to have, so hopefully we can start to get that organised and start planning for next season," he explained. Chairman Johnston added: "Allan has another year on his contract and we've already discussed with Allan his plans for next season. "Now that we know where we are and which division we're playing in, we can make financial plans accordingly. We'll sit down and discuss how we're going to proceed for next season. "We stood by Allan through some difficult times this season, we looked closely at the results and the situation we were in running in to these last few matches. "We decided that Allan was the man to lead the team and he's shown that that was the right decision."